I was up bright and early.. yeah, 4:30am to be exact. Lol.. The rest of the family was up and we were out of the house by 7:25am. (Not too bad, a smidge late though). Stopped off at Mc Donald’s for a drive thru breakfast run- that ended up taking a few extra minutes off our time (can you say s-l-o-w). Finally, we were on the road heading for a day of fun. Zipping along on the highway, time just seemed to zip by really fast. We did have to make a rest stop, which I was hoping that we would not have to do. Time was of the essence at this point in the trip. It was 9:09am and we had to be there by 10, it would be close. Traffic was normal heading into Atlanta, a few congested areas but overall, not too bad. Found our way to the parking lot, pull up, grab ticket, park then fast walk over to the World of Coca-Cola Museum. We made it and we had nine minutes to spare! Went through security and we were finally on our way through the museum. Once inside you are greeted by these huge Coke bottles from around the world. You are greeted and asked to enter a room where you are surrounded by memorabilia, learn where others are visiting from and get a bit of background about the drink. You are asked to find out where the items around you are from in the world and just take it all in. Then off you go to watch a short animated movie that will look familiar to you. They have taken the ever popular Happy Factory commercial and increased the length just a bit. If you want to watch it here is the clicky for it at YouTube (it's safe). As a side note, the some voices are of actual employees. 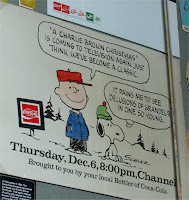 <--- They even had a Charlie Brown & Snoopy sign! have to say you MUST try that one, you just must. *shudder* Then we were off to Latin America to try a few flavors before we darted off to have a glass of the true Coca-Cola. 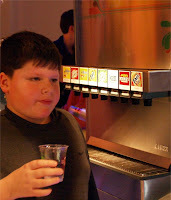 So what were my favorite flavors? Spencer trying out something from the Africa taste area. He did like one from this station, not sure which one. Oh! There was also a chocolate flavored soda from Ecuador, which was really interesting. I could see myself drinking all the time but a snip now and then would be nice. It is really interesting to see what the rest of the world drinks. 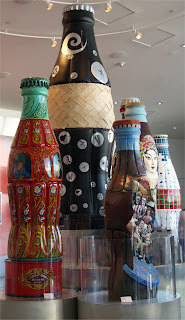 When you have had your fill of Coke products, done with the museum, you are treated to a glass bottle of soda as your souvenir (these are the ones you watched being bottled). What a fun and cool museum. We checked out the Coke store and purchased a few small items, of which are these cool bottles the boys decorated. Next up the Georgia Aquarium! Wow.. this place is huge! The set up is easy to follow and you can bop around to other exhibits if you notice others are quite crowded. Nate made a bee line for the tidal touch pool to touch the Sting Rays. He was quite impressed at how soft they were, totally not what he expected. Spencer was a bit reserved, he was afraid of a tail coming up at him. The sharks they had there kept zipping by Nate. His fingers were in just waiting for one to come near him but they would go right around. Needless to say he was disappointed over not being able to touch one. They tried touching some shrimp but they kept scuttling away, lol. 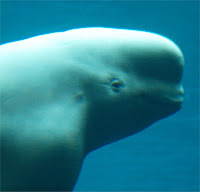 The one item I had wanted to see was the Beluga Whales. I was not disappointed. Nico was the Beluga we saw during our visit. He is simply beautiful. We saw the Sea Otters, Jelly Fish, Sea Turtles, HUGE Cat Fish, Whale Sharks, Penguins (love penguins), and all types of fish. 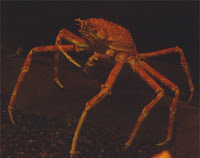 <--These Japanese Spider Crabs just creeped me out. No flash area but the picture does capture their size. At one point you enter a large room and are totally in awe at what is in front of you. A whole wall tank, I mean this thing is absolutely huge. 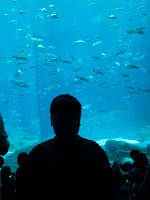 You can see the various sharks, sting rays, all types of fish, it is so magnificent. The aquarium was a big hit, our tummies were growling for our picnic lunch so we were ready to head to the car. We had a picnic lunch heading home (needed to get a jump on the commute traffic) and decided to stop off at a Mayfield milk plant for an ice cream break on the way home. This was the perfect way to end the day. The weather was absolutely beautiful, we could not have asked for a better day! I have placed quite a few of my pictures in this link to Flickr if you would like to view them. It was a fabulous day and both museums are a must see if you are ever in Atlanta. You will not be disappointed in the least. These are two bottles the Nate and Spencer wrapped at the World of Coke Museum.